Although it sounds like a joke and looks like some kind of modern art gone wrong right, this Cannon equipped 1959 Vespa scooter supposedly actually served duty defending the Italian province of Messina. 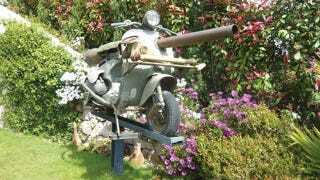 We aren't sure if this Vespa cannon was exactly how much active defense duty before it was stored for three decades, but it was ready to defend if the need ever arose. That is at least according to Coy's who will be selling the Vespa at their Monaco auction next week. According to the auction house, this Vespa was a way to transport the small cannon seen here to more inaccessible parts of Messina. Once you arrived at the firing point stabilizers were used to steady the scooter/weapon and fire RPGs. Even though the cannon was not designed to be fired while driving we imagine the sensation of riding to your destination with an active weapon as a seat was a little unnerving—not to mention extremely uncomfortable. Anyone looking to put this scooter back into active defense service will be disappointed to find out the cannon has been de-activated. Despite the fact it can no longer fire RPGs or even any other less lethal items, the pre auction estimate on this unique half scooter half weapon is still €12,000 to €15,000, which translates to about $16,000 to $20,000.